Since 1969 Canadian women have had access to legal abortions. Legalization originated with a bill introduced by then Justice Minister Pierre Elliot Trudeau, amending Section 251 of the Criminal Code allowing abortions if a woman’s “health” was deemed “at risk”. The word “health” wasn’t defined or limited. The government wasn’t involved, approvals granted by a panel of three doctors. Abortions took place in accredited hospitals by a licensed doctor, all other abortions remained under the Criminal Code. 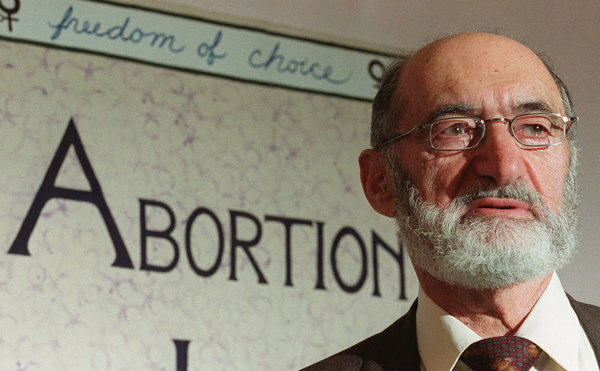 In 1988 the Supreme Court struck down Section 251 of the Criminal Code following a challenge brought by Henry Morgentaler. The court ruled law not applied equally across the country violated the “security of the person” guarantee under Section 7 of the Canadian Charter of Rights and Freedom – some hospitals didn’t form abortion committees, others approved all abortions, a few became known for unreasonably strict judgement. Only one of the seven Supreme Court Justices, Madame Justice Bertha Wilson supported a woman’s right to abortion in the first trimester. Ultimately the court’s decision was based on procedural grounds. The court didn’t declare abortion a constitutional right, nor did it extend rights to a fetus. Why ponder abortion in Canada? A story out of Saskatchewan answers that question. With the Federal election in full swing, anti-abortion group CCBR (Canadian Centre for Bio-Ethical Reform) is going after Justin Trudeau. CCBR members first appeared on Saskatoon street-corners in June, offering pamphlets with graphic full colour images of aborted fetuses. Faster than Stephen Harper could call an election over the holiday weekend, CCBR members stuffed images of Justin Trudeau beside aborted fetuses into unsealed white envelopes, asking Canada Post to deliver “a vote for Trudeau is a vote for this” to unsuspecting households. Julee Sanderson, head of the Canadian Postal Workers Union in Saskatoon voiced sentiments of horrified postal workers. “We have keys to enter buildings, to put mail into mailboxes, or community mailboxes that other organizations or flyer delivery companies don’t have access to, and [receiving these kinds of flyers] is not a consumer’s choice,” said Sanderson. Canada Post considers refusal to deliver mail serious misconduct, punishable with a 3-5 day suspension without pay. On Wednesday 4 letter carriers refused to deliver CCBR pamphlets. Their supervisor told them to go home, then changed his mind and said they could work today, Sanderson said. Why can’t anti-abortion zealots let it go? Canada allowed freedom of choice 27 years ago, do they actually believe Canada willing to turn back time? Do they think abortion is a frivolous decision? Do they consider the fate of marginalized, unwanted children? Have they a clue about the state of Canada’s child welfare system? Why should postal workers be forced to deliver graphic material to unsuspecting households when the issue is a done deal? What do they hope to gain by standing on soap boxes? This is Canada. Canadians don’t force other Canadians to deliver graphic election propaganda against their will. CCBR pamphlets cross all boundaries of common sense and decency. Abortion is legal in Canada, and there are much bigger fish to fry.